Since posting The Bitter Legacy of Sykes-Picot a couple of weeks back, I have run across a couple of points substantiating the thesis therein, namely that two untraveled mandarins were ill-qualified to carve up one of the world’s great powder kegs along lines that suited their respective empires. Quite apart from leading the Arab Revolt of that time against the Turks, T.E. Lawrence used his experience to argue a different approach. Apart from listening to men from across the Middle East who were serving in the army of Britain’s Arab allies against Turkey, he was also in contact with other British experts on the region, such as DG Hogarth and Gilbert Clayton. Lawrence’s suggestions however fell foul of the British administration in Mesopotamia. 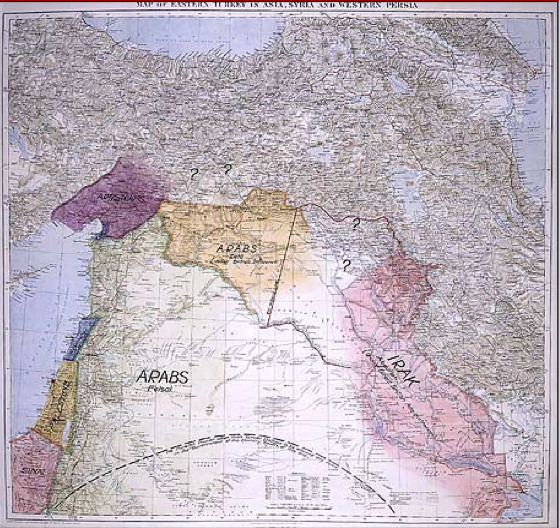 Note how provision for a Kurdish homeland (still unrealised) and an Arab unity outside of Palestine. Had such a proposal for sovereign countries (not just protectorates to be subsumed into existing empires) been followed, much of the mayhem that has plagued the region in the century since might have been avoided. This entry was posted in Politics and tagged iraq; middle esst;. Bookmark the permalink.